This time of year, the beautiful mandarin oranges arrive complete with leaves. I couldn't resist this guy with his bedraggled leaf. 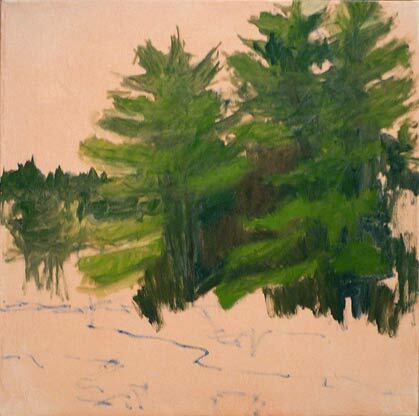 The painting was done on a panel Suzanne deLesseps had made up one year to use on a trip to France, it's very thin and weighs almost nothing. 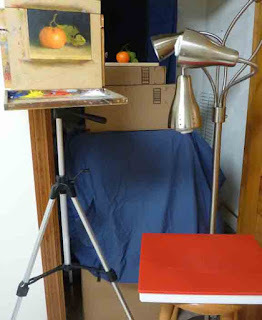 I set up the still life in a closet, backed by black fabric, with an octopus light shining one bulb across the front of the set up, another pointed at the painting surface, and a third at the palette (sitting where the red box is in the photo). 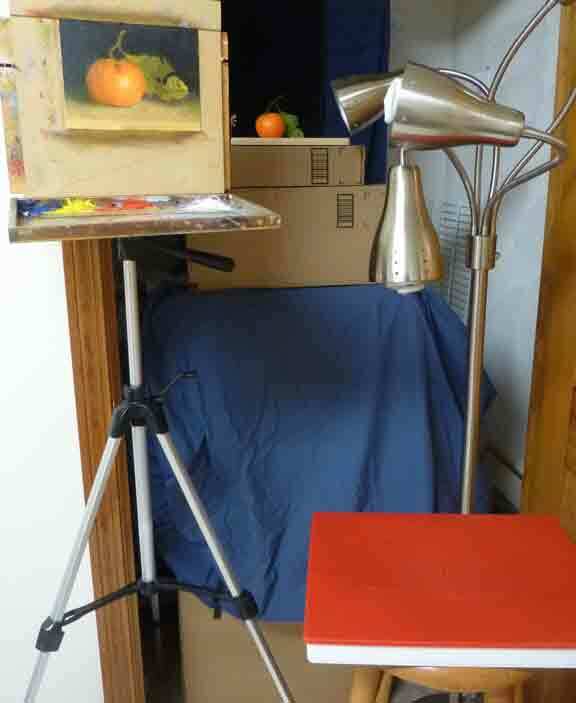 The photo shows the setup with the room light on, but it was off, and it was dark outside, when I painted this. 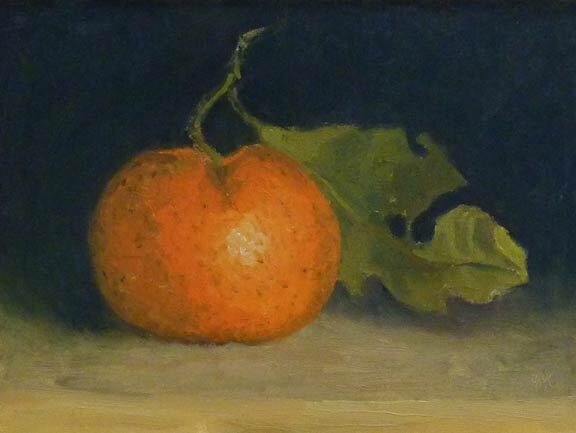 The black-ish background came from mixing alizarin crimson and viridian. Does anyone know why the mandarins are available with leaves in the US, and other citrus fruits are not? And, I did have trouble photographing this, it has been very dark and dreary here. When I have some more light, I'll try again. It seems like this is the winter of experimentation, here in bitterly cold New England. 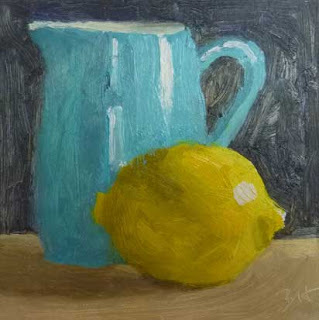 First there were lemons, and then bigger paintings. 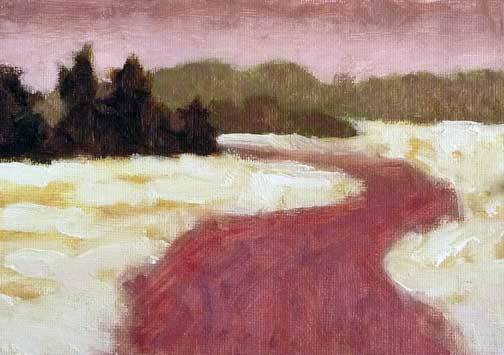 I'd also like to do some variations on a landscape composition, looking at color. At first, I wasn't sure if this view of Nagog Pond would work, but the more time I spent there, the more sunsets I saw, and as the ice came and went, and came back, I found a lot to inspire me. 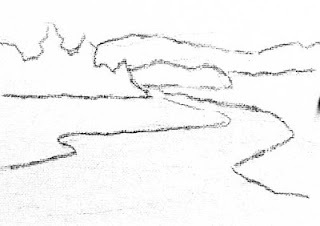 So here goes, Nagog Pond #0 (a value study from late October), and variation #1, thinking of evening, and rivers in the ice. I used a limited palette of yellow ochre, alizarin crimson, black, and white. A task I've assigned myself this winter is to learn how to make compelling paintings from plein air studies. The idea is not to simply take a larger brush and do the same thing bigger, but to make a new painting, expressing my feel for the place in a different way. 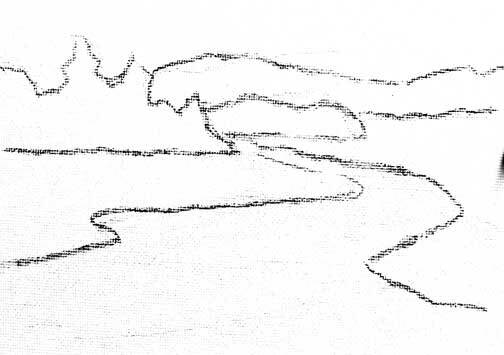 I took this problem to a class I'm taking with Marais Platais at the Concord Art Association. 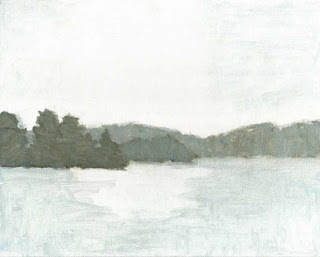 I painted Russell Millpond in the spring of 2010. 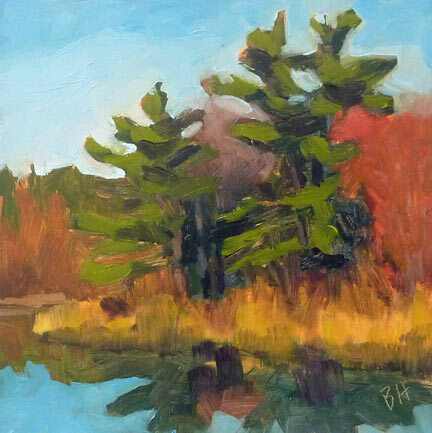 - Use both the plein air painting and any reference photos to gather information. - Remember that for each brush stroke in the small painting, there will be several of different sizes in the larger one. - Think of the whole tree in the small painting as the top of the same tree in the larger painting. - Don't paint a copy of the reference photo, another thing I wanted to avoid, but zoom in (thank you, ipad) on areas to see patterns and color variations that could be useful in the larger painting. I like this result much better than my first attempt. Now I'm back in my comfort zone with lemon #4 re-described in gouache. I've done quite a few small paintings in gouache, it reminds me most of painting in oil in terms of consistency and color mixing, but of course, dries much much faster. I used some dry brush here, which I'd like to learn to do in oil. - Sally recommends Robin Rosenthal's "Egg and Lemons", it's great. And check out Robin's other work. 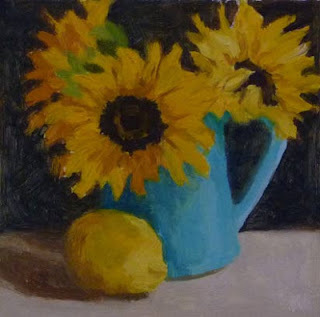 I also like the next painting on her blog, "Bananas and Teal Jar". - Janett Marie recommends Julie Ford Oliver's "More Lemons", and if you look at Julie's posts in May of 2012, there are a lot more, just scroll down a bit. And don't miss the sunflowers in the polka dot pot, I love that one too! 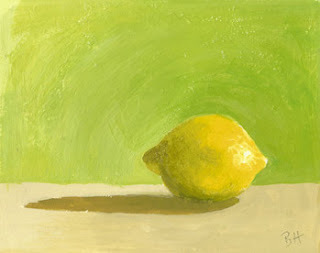 - Do take a look at my dear friend Joelle Feldman's "For Limoncello", it is one of my favorites. 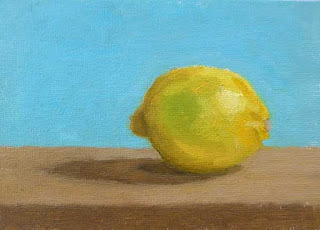 - And finally, Julian Merrow-Smith has done many lemon paintings, "Lemon and Cup" is my all time favorite of his, though I have to confess, the pottery mug (David Garland, I think) in this painting grabs me too. 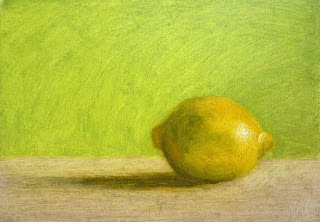 Any more favorite lemon paintings before I include them in a post? Thanks to those who've spoken up so far, I'm enjoying the exploration. Sunflowers in January, thank you Trader Joe's! My husband says this one is about the sunflowers, so I guess lemon #5 is jealous. I think Janett predicted this... And then there's the blue jug, I just love it. And blue and yellow are such a good combination, I couldn't resist. If you will email me a link to your favorite lemon painting, I'll include the links in the next lemon post. Please use a link that will be permanent, like a blog post, rather than a page on a website (those are subject to change) and include the artists name. My email address is in my profile. It's not all lemons here on my blog this month! 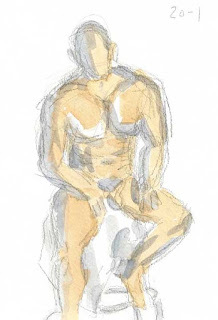 On Wednesday night I went to the weekly life drawing session at the Concord Art Association. 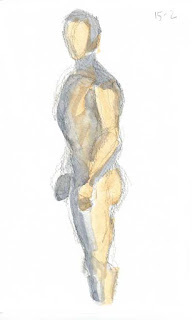 We had a great model, and I was able to add some watercolor to my drawings on the longer poses (15 and 20 minutes). It's such a good thing to do, I hope I can become a regular. 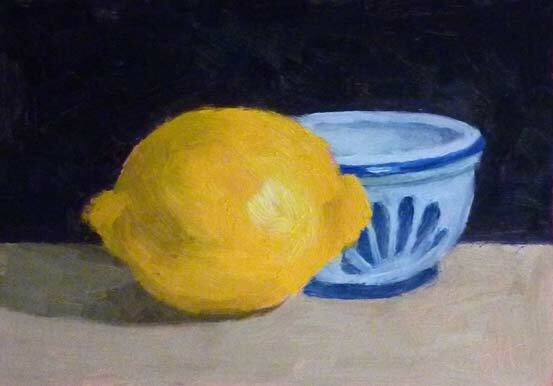 There was lots of paint on lemon #3, and here I'm back in my comfort zone with not so much paint. I like the subtlety of this one. Just a lemon sitting on a cutting board with green tissue paper behind it. And I really studied the lemon. I love this little dish. I don't remember where it came from, but we keep garlic in it. And as you can probably guess, I spent more time on the dish than on the lemon! For the second lemon I wanted to add something, and I love this blue jug. And I like that it's the color of the background on Lemon #1. This time I used Fabriano watercolor paper with one coat of gesso, and roughly the same palette. I like it. And thanks to those who made suggestions for what's next. I started this blog in 2009 with a goal of improving my painting, by painting regularly and often, just like practicing a musical instrument. And it worked (compare the paintings from early 2009 with those in the summer of 2010). But after a while, I felt like I was doing the same thing over and over. And then life intervened, and I slowed way down. And I could feel how rusty I was getting. So it's time to get back to practicing! 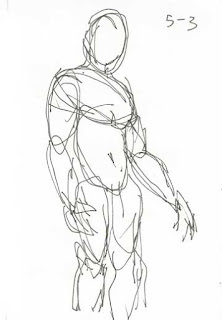 And to give that some structure, here's the plan: each month I'm giving myself an assignment; a subject to learn to paint better, a process experiment, something to focus on. 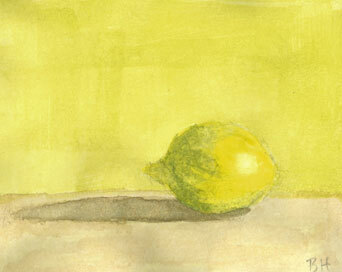 This month, I'm painting lemons. Here's the first one, really simple, a single lemon sitting on a cardboard box. Any ideas for the next one?